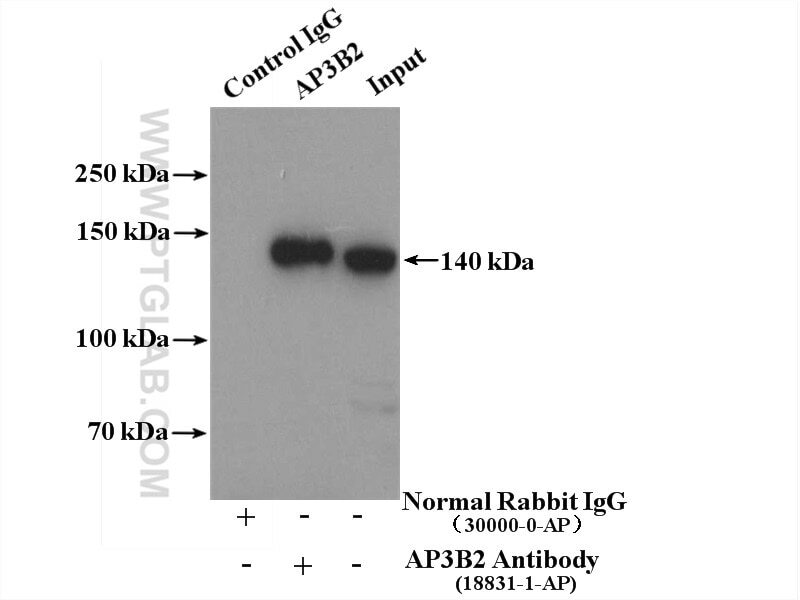 IP Result of anti-AP3B2 (IP:18331-1-AP, 4ug; Detection:18331-1-AP 1:500) with mouse brain tissue lysate 3600ug. Adaptor protein (AP) complexes are cytosolic heterotetramers that mediate the sorting of membrane proteins in the secretory and endocytic pathways. AP3B2 is a subunit of the AP-3 complex which is composed of two large adaptins (AP3D1 and AP3B1 or AP3B2), a medium adaptin (AP3M1 or AP3M2) and a small adaptin (APS1 or AP3S2). AP-3 complex is associated with the Golgi region as well as more peripheral structures. It facilitates the budding of vesicles from the Golgi membrane and may be directly involved in trafficking to lysosomes.